You really are going to get the hang of playing poker games by looking around this website and making use of my many different game guides. However, a good place to start learning more about playing games such as Texas Hold’em Poker is to find out which are the lowest ranked hands working up to the highest ranked poker hands. As each game is going to have several different betting and playing rounds, your hand will of course get more cards dealt out to it as each round progresses. Therefore it is important to know the value of each hand on each round. With that in mind below you will find the lowest ranked Texas Hold’em Poker hands working up to the very strongest poker hand, so read on for as soon as you have memorised the following hand rankings, you can then move on to learning about aspects of playing Texas Hold’em, and you do have many aspects of that game to learn by the way! The very lowest hand you can form when playing the poker game variant of Texas Hold’em Poker is a High Card hand, that s basically any hand combination that does not fall into any of the rankings that are listed below, and it is the highest valued card in that hand that gives it its value. You should be very wary of ever playing on with just a High Card ranked hand, for when playing here is always going to be a very good chance that another player is going to have a much better ranked hand, or even a high card hand that has a higher value than yours. But is should also be pointed out that many players have of course managed to bluff their way to the pot when playing with just a high card hand, but that is and always will be a very high risk thing to do! Next in order of the lowest to highest ranked hands that you are going to come across and will have a very fair chance of being dealt out when playing Texas Hold’em Poker is a One Pair hand. 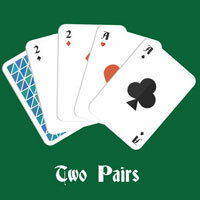 A pair of matching cards such as two Queens, two Aces or even two 4’s are classed as a One Pair hand, and as you could be dealt out that hand as your pocket cards you should try and learn the value and odds of any initial one pair hand you have been dealt out winning a game. You are of course going to have to wait until the flop to discover whether you are holding a two pair hand, and that is hand in which you have two cards of the same exact value twice in your hand. 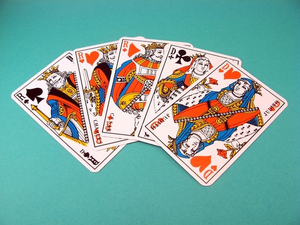 Keep in mind though any picture cards must be matching ones, so a Queen and a King is not a pair of tens for example, but you will find this is a very common hand, that can and does regular win may pots by players. An example of a two pair hand could be for example 2 x 5’s and 2x 9s. Moving onto the next highest ranked poker hand in most poker games, that hand is a three of a kind hand. The name of it does give you an indication as to just what cards you have to hold to form that hand. 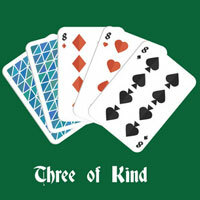 An example of a three of a kind hand could be 3 x8’s and any other two cards, and the definition of that hand is three playing cards of the same rank. 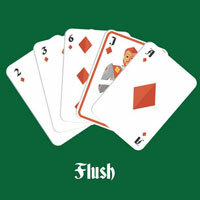 It is not uncommon or unusual for players to get dealt out this hand when playing. You are likely to be dealt out or see one of your fellow players being dealt out the next highest ranked poker hands, and that is the straight hand. 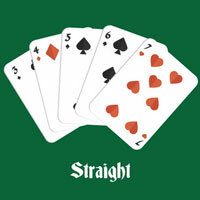 To form such a hand you have to be dealt out five cards in your hand that are in sequence, but that are not of the same suit, rather that hand is made up of a mixed suit of sequential cards. So an example of this kind of hand is a 4, 5, 6, 7 and 8 and as mentioned they must be in any suits but not all the same suit. A Flush hand is one that can have a great deal of success at the showdown stage of a poker game, and when you have such a hand you do have a very fair and reasonable chance of winning with it. It is any hand made up of any five playing cards that are not sequential that are all of the same suit, so for example such a hand could be the 2, 5, 7, 9 and Jack or Clubs. The last four hands are the rarest hands you can be dealt out and as such in sequence as they are displayed they get stronger and stronger in value. 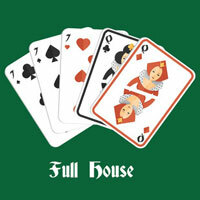 The full house hand for example is a very strong hand and it is one made up of a three or a kind hand and any pair hand to. 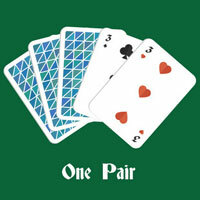 So, if for example you formed a hand containing 3 x Kings and a pair of 4’s then you have formed a full house hand! One hand that every poker player will hoping to get dealt out when playing is of course the four of a kind hand, for the only three other poker hands that can beat it outright are a stronger ranked four of a kind hand or the two hands mentioned down below! 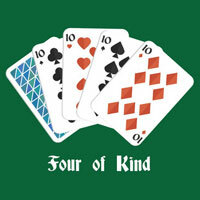 The name of a four of a kind hand does suggest just what that hand is made up of and it is of course four cards of the same rank, which could be 4 x 7’s and an Ace for example or 4 x5’s and a 10! 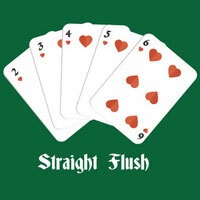 The straight flush hand is one of the highest ranked poker hands you can be dealt out, and it is a hand containing five playing cards that are in sequence, but they must all be in the same suit. I should however point out that if the five cards you have formed your hand with begin with a 10 and are in sequence and in the same suit, then you will not have formed a straight flush hand but you have formed a Royal Flush hand as described below. 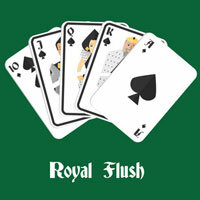 The ultimate and the highest ranked poker hand that you are going to be awarded with when playing poker is of course the illusive Royal Flush hand. It is the rarest of all poker hands, and you could play for a lifetime but never see one or get dealt one out, and that hand is made of on the 10, J, Q, K and Ace which are all in the same suit. You now know how the poker hands are ranked in most poker games, however what you are also going to come across are progressive jackpots that can be won by players if one particular high ranked poker hand is beaten by another. Those progressive jackpots are known as Bad Beat jackpots and they can be attached and be on offer on a range of different poker game variants. 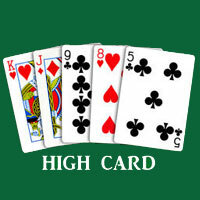 The way in which they have been designed is such that if for example a poker player has been dealt out a four of a kind hand, which is a fairly rare hand in the grander scheme of things, but that strong and fairly rare hand is beaten by a much higher valued hand, then the Bad Beat jackpot is triggered and awarded. It is however a jackpot that is shared out often between the players sat around the poker table that it what won at, however each poker site is going to have the own unique set of rules as to how the jackpot is to be shared out. It is however often the case that the player who strong hand was beaten by another much stronger hand is awarded the lion’s share of the Bad Beat jackpot, and that is rightly so in my opinion! However, as long as the other players were involved in the game and often they are required to have been in the showdown stage of the game, then they will be awarded a share of the jackpot. I would always advise you to read through the rules and terms and conditions attached to any Bad Beat jackpots you do come across, for they can be and often are different at different poker sites, so always double check to see not only how they can be won but how the jackpot funds are distributed too!